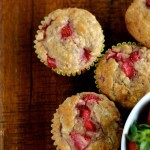 Fresh strawberries, oats and buttermilk combine in these healthy breakfast muffins that are perfect for breakfast, a snack and even dessert! 1/4 cup oil grapeseed, melted coconut, etc. Using the “bake” setting with convection on, preheat your KitchenAid® 12” Convection Digital Countertop Oven to 400°F*. Lightly spray or grease the muffin tin. Set aside. In a large bowl, combine oats and buttermilk to soak 15 minutes. In a second bowl, whisk together flour, salt, baking soda, baking powder, salt and cinnamon. Stir the oil, egg, brown sugar and vanilla into the soaked oat mixture. Add dry ingredients. Stir just until combined. Do not overmix. Gently fold strawberries into the batter. Spoon the batter into the prepared muffin tin. Bake 12 minutes. Remove from the oven. Let the muffins cool in the pan 5 minutes then transfer to a cooling rack. These muffins are best served warm but also freeze and reheat well. I don’t recommend using paper muffin cups in this recipe. Baking directly on the muffin tin produced the best results – keeping the moisture in and creating a nice crust on the outside. * If you are using a standard (non convection) oven, preheat the oven to 400°F and cook 18-20 minutes.